Ibis Brisbane is conveniently located in the city center, within easy walking distance of the Queen Street Mall shopping precinct, Treasury Casino, South Bank Parklands, Brisbane Convention and Exhibition Centre, Queensland Performing Arts Centre and Roma Street Transit Centre. The hotel features 218 rooms, a restaurant and bar. Guests also have access to food and beverage outlets and conference facilities at the neighboring Mercure Hotel. With its superb central location, ibis Brisbane provides the ideal base for exploring the best of Brisbane, from its stylish cafés, bars and restaurants, to its many cultural, sporting and historical attractions. Guests staying at this convenient Brisbane hotel are within walking distance of Suncorp Stadium and Roma Street, as well as a range of public transport options. By walking over Kurilpa Bridge, guests can discover South Bank, Gallery of Modern Art, the Wheel of Brisbane and the Queensland Museum. 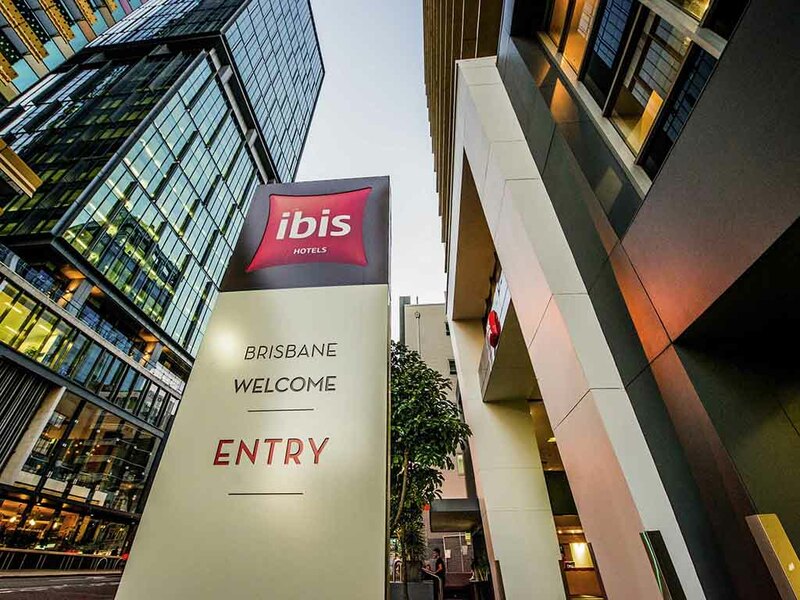 Within walking distance of many of Brisbane's top attractions, ibis Brisbane is the ideal choice for visitors looking to explore the city. The hotel is within reach of Suncorp Stadium, Roma Street, South Bank, Queensland Museum and the Wheel of Brisbane. ibis Brisbane features a 24 hour, grab n go, menu, broadband and Wi Fi access, paid off site parking, located on 40 Tank Street, a web corner, guest laundry facilities and tea & coffee making facilities. Spacious, contemporary in design, and adaptable, the Ibis room is truly a place for living, perfect for all your needs. well appointed ensuite, air conditioning, a large work space with desk and chair, and an LCD TV. Guests can also benefit from the hotel's 15 minute satisfaction guarantee, to fix any breakfast or room related problem within 15 minutes. The Restaurant offers a delicious full buffet for breakfast from 6am to 9.30am midweek and 6.30am to 10am on weekends. An appetising a la carte dinner menu is available daily from 6pm to 9pm. Great location - this was my favourite thing, and the staff were awesome. Amenities were fine, not as flash as the pictures, and smelt a bit musty (damp air-con smell) but otherwise fine. Bed was really comfortable! Was a good stay,Staff very friendly but on one morning the room was only half completed,the beds remained unmade,I done them myself,no big deal although some might think different. Staff check-in and check-out efficient. Great location , Right price , Very clean , Great size room , Walk to Queen St Mall & Southbank. The reception staff were very friendly and efficient. The hotel was very nice and in a great location for what we needed. Staff were friendlt, unfortunately our room was not clean, when laying on the bed all one could see was the dirty vents. We were not a fan of having to walk up a flight of stairs to our room and not being able to go out onto the balcony. Strange smell on floor 4. No extractor fan in our bathroom. Had to move room due to our door not locking, which was a concern as we identified that issue later in the day after having all gone out that afternoon, meaning our room was left unsecured for that time. We were 'upgraded' but the room looked the same. Breakfast was average and not particularly nice. It was a girlfriends weekend in the city. I was looking for a good value for money overnight stay, with parking included. I needed a room for the night as I was in town to her my talented cousin in the Opera Queensland production. The hotel was very conveniently located near the Roma St station as I had travelled from the airport.. and then it was just a short walk to the concert hall.. The room was clean and the bed comfortable.. breakfast the next morning was very good. Again, a short walk to the Roma St station to travel to the airport. My accomodation experience was very good overall.. Thanks very much indeed... I’d certainly stay again another time..
Great to have 24 hour reception as we arrived very late. Close to the city and walking distance to South Bank. This was a great hotel , Central to shops , Queen Street Mall , 10-15 min walk to Southbank. We arrived early at lunchtime and they let us in without any hesitation. We would definitely stay here again. The room was clean and comfortable bed. Me and my friend just stay for a night in IBIS love the location it is close to everything and the staff are friendly, room is clean and bed is comfortable.